The party and cash awards ceremony for the last round of Firebreathers will be THIS Sunday Feb 17 from 2:30-4:30. We will be having an SRC social for ALL MEMBERS! The social will include field games(think 5th grade field day! ), paleo snacks and awards for our top competitors. Be there to get your cash! Be there ready to play at 2:30! If you are participating in the nutrition challenge, the firebreather field games count as a WOD. The competition is getting fierce! People are already completing their goals and food logs are looking good. HOWEVER, there are still some cheats floating around so it’s anyone’s game! The top 5 competitors with the most points so far will be posted on Thursday’s Blog. Chuck is still getting his WODs in while he’s on the West Coast for work. 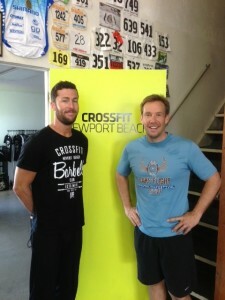 He visited CF Newport Beach yesterday and Orange County CF the day before. No excuses!